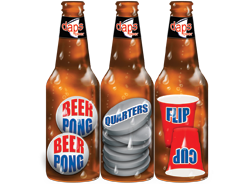 THE OBJECT OF THE GAME is to fill your empty 6-PACK game piece with Mini Bottles that are awarded throughout the game. Bottles are awarded thru Mini-Competitions designated by a bottle image on the board. Preparation: To begin you will need to assemble the game board by following the DRINK CUP ASSEMBLY directions found below. You will need: 1 quarter (not included), 3 plastic red cups (not included), 2 ping-pong balls, 2 dice and the deck of playing cards. Place one red cup in the center of the board on the DRINK CUP spot. Set aside the other two cups for playing FLIP CUP. A comfortable amount of your favorite beverage is poured in the DRINK CUP. Place the deck of cards face down on the deck of cards spot. HOW TO PLAY: Each player chooses an empty 6-pack holder and begins on the space marked START (MAKE A RULE). To begin the game, one player will SPIN THE BOTTLE. Whoever the Bottle is pointed to will begin the game by rolling the dice. The number rolled is the amount of spaces the player will move. The game order moves clockwise. Each player plays the game with their favorite beverage in-hand. Throughout the game you will be either drinking or passing out an amount of “Sips” to other players. Depending on how you want to play, players can also count the amount of “Sips” in “Seconds”. “Sips” and counting the amount of “Sips” in “Seconds” are discretionary. Game play always defers to the “House Rules” meaning the owner of the game/house gets the final say on how the game is played and which type you use. PARTNER GAME PLAY: You may partner up with people by sharing the 6-pack game pieces. This allows up to 12 people to play at once. When partnering up, rotate partners throughout the Mini-Competitions (FLIP CUP, BEER PONG, QUARTERS) until the Mini Bottle is won. For FLIP CUP, choose the amount of cups to use and play as a relay race against the other team. 2. Pour some drink into DRINK CUP. b. Playing “Sips” or “Seconds”. 4. Place Deck of Cards face-down. 5. Choose Empty 6-Packs game piece. 6. Spin the Bottle to see who starts. 7. Roll the dice to move (clockwise). When you land on BEER PONG, QUARTERS & FLIP CUP; you choose another player to compete against by Spinning the Bottle located in the middle of the board. Whoever the Bottle is pointing to will be your opponent. Whoever wins the mini competition is awarded a Mini Bottle and places that Mini Bottle into their 6-PACK game piece. Fill up your 6-PACK to win DRINK-A-PALOOZA. For BEER PONG; the first person to shoot the ping pong ball in the Drink Cup wins the Mini Bottle. Loser drinks the DRINK CUP then refills it with a small amount of a designated beverage. Allowing “Rebuttals” are established in the “House Rules”. For QUARTERS; the first person to bounce a quarter in the Drink Cup wins the Mini Bottle. * A “Rebuttal” is easily described as a player’s fair-ups. Using the extra plastic cups, flip the cup over from right-side up to top-side down. First person to win in FLIP CUP wins the Mini Bottle. After the game has started, when a player passes START (MAKE A RULE); the player will make a rule for the entire rest of the game. ( i.e. Thumb Master: When the “Thumb Master” (player who made this Rule) secretly places their thumb on the table, the other players must do the same. The last person to place their thumb on the table must drink until the Thumb Master puts his thumb down; Example (2): No “Drink, Drank, or Drunk” you cannot say ”Drink, Drank or Drunk” if you do; you must take a “Sip”, etc. When you land on this space, your game piece is moved across the board to the DRUNK TANK space located below WATERFALL. You must stay in the DRUNK TANK until you roll a 1 on the die. You have 3 chances to roll a 1 per turn. If a 1 is not rolled in these 3 chances, it is the next players turn. If you roll a 1 you get out of the DRUNK TANK and your game piece is placed on the WATERFALL space. At this time you begin a WATERFALL (See “WATERFALL” for instructions). If you do not roll a 1 on your 3rd consecutive turn, you are automatically let out of the DRUNK TANK. The number you last rolled on the die is the number of spaces you will move beginning with the WATERFALL space. Land here and you drink the middle DRINK CUP. Refill with a small amount of beverage from a designated drink. Draw a card from the deck. If the card’s color matches the color on the space you landed on, then you pass out a “Sip”. If the card drawn is not the same color, you drink a “Sip” of your own beverage. Using a designated community drink; pour a small amount into the center DRINK CUP. Take 1 “Sip” of your drink and you lose your next turn. Everyone cheers each other and takes a “Sip” of their own drink. Spin the bottle located in the middle of the board. The person who the bottle points to will drink the number of “Sips” indicated on that space. Land here and you are 3-MAN. When a three is rolled, the 3-MAN takes a “Sip”. If a 3 is rolled by the 3-MAN then that player is no longer 3-MAN. If another player lands on the 3-MAN spot, that player becomes the new 3-MAN. Everyone participates in HIGH/LOW. Draw a card from the deck. The next player will guess if next card drawn will be higher or lower than the last card drawn. If correct, the game continues to the next person in rotation who guesses “HIGH” or “LOW” for the next card. If incorrect, that player will take a “Sip” for each card drawn of their own beverage. Take a Mini Bottle game piece from any other player. Everyone playing participates in KING’S CUP. Draw a card from the deck of cards. Reference the Chalk Board with Kings Cup Rules and play the game for that card number. Once complete, the next person in rotation pulls a card and plays another round of Kings. Play one round of Kings per person playing. If you lose take a “Sip”. 2 Card – “2 is for You” = Choose another player to take a “Sip”. 3 Card – “3 is for Me” = Take a “Sip” of your own drink. 4 Card – “4 Floor” = Everyone points their hands towards the floor, the last player to do so must take a “Sip”. 5 Card – “5 is for Guys” = Guys take a “Sip”. 6 Card – “6 is for Chicks” = Girls take a “Sip”. 7 Card – “7 Heaven” = Everyone points their hands up towards the sky, the last player to do so must take a “Sip”. 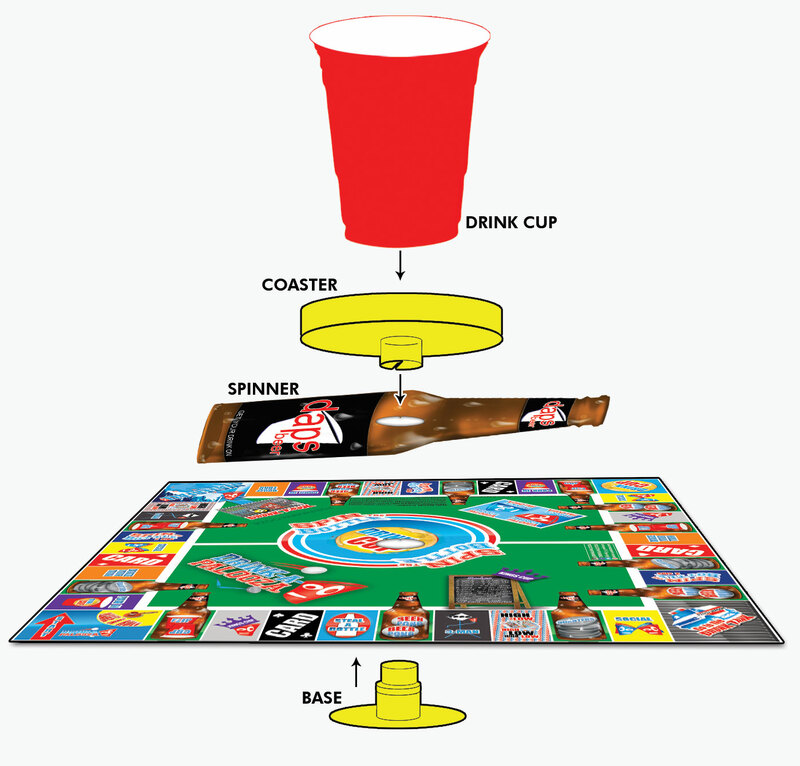 8 Card – “Spin for a Mate” = Spin the Bottle in the middle of the board, whichever player it lands on must take a “Sip”. 9 Card – “Bust a Rhyme” = Player will say a word, sentence or phrase of their choice. The next player in rotation must rhyme with the original player’s word/sentence/phrase. This continues from one player to the next in clockwise rotation until someone fails to rhyme OR spends too much time thinking. The person who fails must take a “Sip”. 10 Card – “Categories” = Player will choose a Category (i.e. – denim brands, types of food, etc). The following player must name something within the original player’s category. This goes from player to player in a clockwise manner and should quickly go around the table until someone stumbles, fail to name something in the category OR spends too much time thinking. The player who fails must take a “Sip”. For example a player could choose “types of soda” as the category…. Orange, Grape, Vanilla, etc. Jack Card – “Never have I Ever” = Player will say “Never have I Ever… (add something you have never done). The other players who have not done whatever the player says will take 1 “Sip”. For example, “Never have I Ever…. gone skydiving”. The other players who have never gone skydiving will take 1 “Sip”. Queen Card – “Questions” = Player will ask the person to their left a question. The point of this game is not to answer ANY question but to immediately ask a different question to another player. This goes from player to player clockwise until someone stumbles by answering the question OR spends too much time thinking. That player must take 1 “Sip”. King Card – “Drink Cup” = Player will drink the center DRINK CUP. Ace Card – “Waterfall” = Player starts a WATERFALL. Please refer to WATERFALL for directions. DRINK-A-PALOOZA® is not intended for use with alcoholic beverages. However, if alcohol is used in the course of this game, DRINK-A-PALOOZA is intended for responsible adults of legal drinking age. 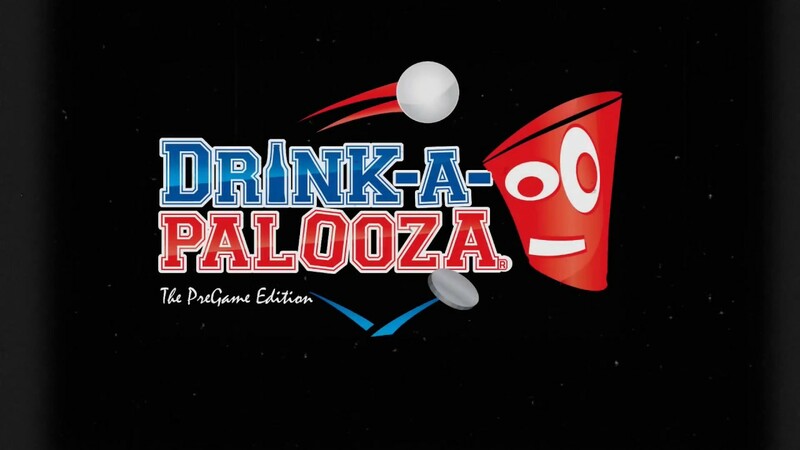 DRINK-A-PALOOZA is intended for entertainment purposes only and players are NOT REQUIRED to drink. Players are encouraged to decline any requests to drink if they do not wish to drink. In no way does DRINK-A-PALOOZA condone or support the abuse or excessive consumption of alcoholic beverages. We believe in moderation and caution when playing our game, which is on no way intended to promote binge drinking, alcoholism, underage drinking, hazing, drunk driving, or any other form of alcohol abuse. If drinking alcoholic beverages, PLEASE DRINK RESPONSIBLY.